Male would have to come to the USA as Linda lives in California. Just for all your info. If you have a nice show male kitten, that would be good. If you have a nice stud male you don't need anymore, that would be nice too. cats Linda has are from Nebelheim and Paradigm catteries. there for a TICA show can bring kitty back with them to the USA. I'm planning kittens after summer Bacardi x Bonny. Check in pawpeds if kittens will be related as far as possible. This will be their second litter. Present litter (2 females) is too young to decide about their standard but Bonny is Ciastek's father. Ciastek belongs to Bernard you can see his (cat of course) pictures here in forum. I told you before that the mothers and son noseline are not perfect, but he will be a new bloodline for you guys in the US. I'd like to have comments from other breeders if they agree with using this nebelung or not. My thought were first not using him for breeding, but some peolple I spoke said why not? away from any similar lines to both mother/son. How bad are the noses? Are they bumpy? Have any photos, are they on your website? Are they real rabbit earred or somewhere in the middle? Diana, she had a male Neb adult she said was really nice last year, not sure if she still has him or not, or, since her health has been bad, if she can even get him shipped across the country, but will call her too and see. Not sure if she even has the male registered. The nose from ABrakadabra's Bereska (Kira) and Petr Sereb Haze is sliding. The ears are not rabbit like ;-), so somewhere in the middle. It is at the moment difficult to tell how the kitten nose developes, I will try to make a picture tonight and sent it to this forum. 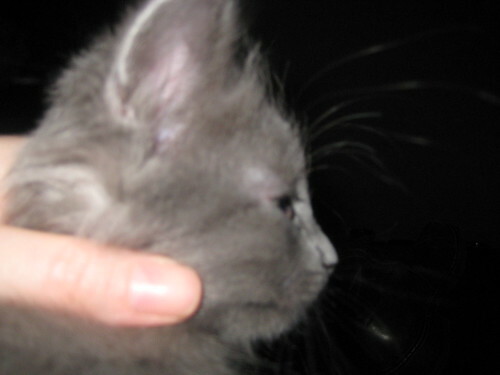 I think for the nebelung breed in US he would be an asset, looking at his bloodline. I gave you acces to the breeders only section. There you can find also some info about breeding plans. I 'm wondering about your favorite type of Nebelung. Which European Nebelungs do you like best? The type differs between them. Some are more American and others more English? Most of us expect kittens this year (some are already born). All beautifull with all different lines. Take your time while investing in a stud. I do think it's hard to tell at this age what the nose will be. It take often a short while to become in it's final form. I was once told that the best you can see what the nose will be like is at birth . When they start drinking and pussing their "soft" bones almost in to mum, it become bended. But when they stop drinking with mum the final shape comes back. Never thot of it that way, but that might be true. Sometimes with our russians, we have a PERFECT strait nose at birth--it is a lovely thing to see as most are a bit squashed looking at birth--LOL. He does have a bit of a dip however--LOL--how old is he now? He is from the 15th of november.